Wendy Johnson will lead the workshops. Registration information will be posted in the next week. Please check back. Click on the image above to see photos of SoXperience. A morning of learning the Magic Loop method of constructing socks was well spent. The group is holding up their sample socks and were very impressed with the ease that they were completed. The afternoon was consumed with the Seaweed Socks, and with great gnashing of teeth, we accomplished Judy's magic cast on for toe up socks. It was easy sailing from there but still took time to get a full size sock knitted to the heel. Saturday evening and Sunday morning were spent with Melissa teaching various methods of enhancing your sock knitting and correcting /avoiding common problems encountered with sock knitting. I think we all agreed that the accomodations from the beautiful view of Chincoteague Bay to the hotel itself were just great. 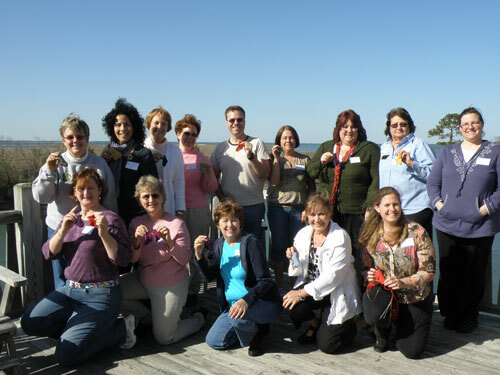 We are looking forward to having more events on Chincoteague Island.